"My life was at risk. My wife and brother were killed on the same day." His name is Lucky - a 20-year-old Nigerian. He is one of more than 118,000 people to have made the perilous journey from Libya to Italy so far this year. Nearly 15,000 have been picked up off the coast of Libya since 28 August. This year alone, almost 3,000 have perished or been lost at sea. With so many arriving so quickly, southern Italy is feeling the pressure. At the port of Pozzallo in Sicily, a naval ship arrived carrying 700 men, women and children rescued from the Mediterranean Sea. Standing at the harbour, we asked a police officer if he could cope. "We have to, what else can we do?" he said with a shrug. Difficulties with processing large numbers of asylum seekers meant that some migrants and refugees had to spend two days aboard a frigate that docked in Messina. Once off the boats, those in need of medical attention are treated in tents at the harbour or taken to hospital in an ambulance. They arrive with just the clothes on their backs. We watched as everyone was given an identification number before being taken to a "hotspot", or temporary centre, to have their fingerprints taken. Weeks or months later they are sent to smaller refugee centres, where they can apply for asylum. If accepted, the interior ministry relocates people to various regions across Italy. We spoke to migrants and refugees who had travelled from across Africa to reach Europe. But one story was repeated again and again. 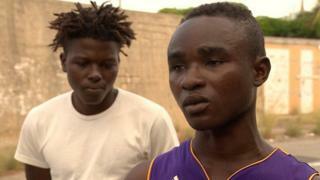 Many of the migrants appeared traumatised by their experiences in Libya. "It was a nightmare," said Lucky. "If many people knew what was going on there, they would not dare to come. "There is killing everyday. I saw killing. I saw a man kill an innocent boy for no reason." Kaiser Tetteh was from Ghana. He was kidnapped and imprisoned for three months in a makeshift jail in Libya by a smuggling gang. "Kidnapping is normal. If you are in a taxi they will kidnap you, they will take everything from you." He said he witnessed the killing of 69 people in Libya during an escape attempt from the prison. "All the time you don't sleep," he said. "Everyone has guns. Even kids have guns." Lucky told us he did not mind where he was resettled in Europe. "I'm a beggar, I don't have any choice. I just want protection. I just need freedom." But for now, Lucky's new home is a tent at a migrant centre in Messina. With a European fleet of ships waiting to rescue migrants off the Libyan coast, some fear it has made life too easy for smugglers. An estimated quarter of a million people are waiting in Libya to reach Europe. A reminder, perhaps, that this crisis is not going away anytime soon.